Home gardening greenhouses establish perfect environments in the right location and climate area. Most greenhouses, however, fall short of the environmental ideal in one or more ways. Victorian botanists developed basic greenhouse technology because they wanted to increase environmental temperatures for tropical plants in the cool climate of England without benefit of central heating or electricity. In the more diverse climate of North America, heating them often requires strategies to capitalize on and supplement solar energy. Position greenhouses to maximize their use of solar energy. The Mississippi State University extension service recommends orienting greenhouses on a north-south axis for efficient use of sunlight as the sun moves during the day. West Virginia University's extension service suggests placement on the south or southwest side of buildings or, at the least, where plants will get an entire morning of sun. The greenhouse should also sit between the longest shadow cast in winter and the limits of summer shadow on the other to use as much solar energy as possible. Use materials that conserve the most heat and admit the most sunlight. Wood and plastic insulate better than metal; glass panels transmit more light than fiberglass. Newer acrylic and poly-carbonates provide near-glass transmission of light with the durability of plastic; double-glazed polycarbonate panels provide insulation similar to residential windows. 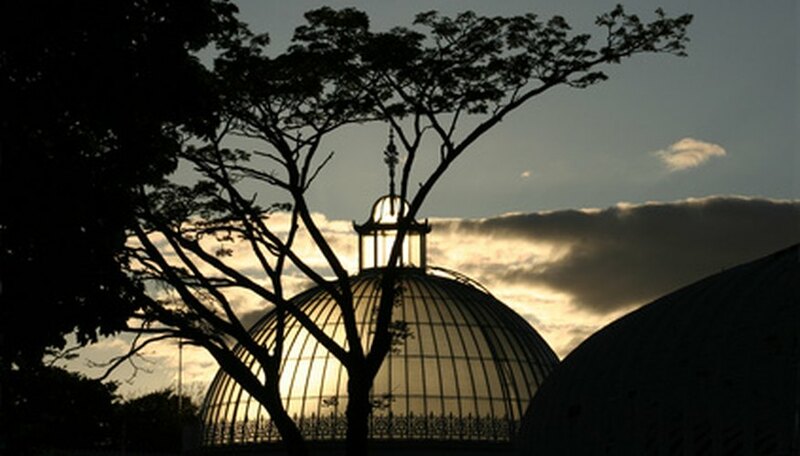 New “one-way” films for glass and plastics admit sunlight but do not allow heat to radiate back out of the greenhouse. Choose designs that can “share” heat sources. Attach greenhouses to buildings in areas where winters are mild; increasing temperatures may be a simple matter of removing summer whitewash or fabric covering from greenhouse panels. In less temperate regions, a common heat pump could serve both buildings or a greenhouse can reclaim heat lost along an adjoining wall. Whether the greenhouse gains any heat from its proximity to a heated building or not, it will be closer to other energy sources such as electricity. Provide supplemental heat to raise the temperature in the greenhouse with a heat pump or heater designed for a greenhouse. Heat loss exceeds that of a residence and heating units must be designed to be very efficient. The size of heating units is expressed in Btu’s--how much heat is produced—and is determined by a formula using the surface exposure, heat loss and range of annual temperature. Design a ventilation system that caries heat to all corners of the greenhouse. In addition to an exhaust flue to draw combustion gases away from plants, distribution ducts keep temperatures even throughout the structure. Circulating fans move heat from the ceiling back down to the benches and floor where plants need it. Make sure that your system is prepared for sudden dips in temperature. Plants like cool night temperatures but many require consistently warmer temperatures to blossom or set fruit. Tomatoes, for example, need temperatures above 67 degrees Fahrenheit to ward off problems like blossom end rot and "catfacing", or malformed fruits. Heaters operate on natural gas, LP gas, diesel fuel, electricity or wood, depending on which is most economical in a specific area. Solar cells provide electricity but solar energy is not yet a widespread, cost-effective energy alternative. Always vent heaters outside the greenhouse; combustion waste products can influence flowering, blossom-set and other growth processes. Design your system to make gradual temperature changes; sudden changes can damage plants. Never just shut all the vents to heat the greenhouse; plants need carbon dioxide and produce oxygen: they will suffocate without ventilation. Can You Put Carpet on a Heated Concrete Floor?